Strolling through the London School of Economics’ glossy university campus, one could easily miss the new exhibition space at The Women’s Library Collection. Tucked outside the main university library, it might be mistaken for a beautifully presented waiting room. In fact, it is a tiny temple to women’s history and well worth a feminist pilgrimage. The collection’s first ever exhibition, Campaigning; Causes and Connections, showcases items that relate both to the Greenham Common Peace Camp and National Union of Women’s Suffrage Societies (NUWSS). In a small, frank and compelling look at the symbolism and strategies of protest, the exhibition successfully unites two disparate worlds: Greenham’s 1980s anti-nuclear feminist project and NUWSS’ late nineteenth century call for suffrage. If you can’t face braving another blockbuster at Tate Modern or enduring the crush of tourists clogging up South Kensington, Campaigning; Causes and Connections offers a quick shot of culture. Small enough to flit through in a few minutes, but detailed enough to merit a long linger, the exhibition is thought-provoking without being complex and informative without being dense. If you’re looking for an intense education in women’s liberation then this won’t hit the spot (but nor will anything else, short of a few years’ light reading). If you want an engaging, sincere and approachable introduction to two seminal feminist achievements, you couldn’t ask for more. Not only does the exhibition’s small size make it an easy lunchtime layover for your brain, it perfectly reinforces the role that small-scale, small-scope work plays in creating lasting change. Objects as tiny as CND badges and handwritten lists of solicitors’ names testify to the modest origins of even grand political outcomes. One scrawled note advises Greenham’s activists “what to do when […] arrested” and shares a case with some of Keir Hardie and Emmeline Pankhurst’s astonishing correspondence. These documents are heartbreakingly simple and remind us of the tiny interpersonal relationships underpinning the seemingly tidal changes of history. Today’s feminism often tends more towards the commercial than the counter-cultural. Feminist books represent a small industry, and their poster-women, from Lena Dunham to Chimamanda Ngozie Adichie, are renowned in part for their ability to shift products. Against this backdrop, Greenham Common feels all the more remarkable. It is refreshing to revisit, even for a few minutes, the restless optimism of a peace camp that sought to disavow global military-industrial politics. Campaigning; Causes and Connections is energising precisely because it brings us close to the women who gave years of protest to opposing a politics with which they could not agree. That they presented themselves as mothers and ordinary women is all the more poignant. NUWSS’ artefacts are an eloquent reminder of what women in the late nineteenth and early twentieth centuries were forced to prove about themselves. NUWSS’ drive to assert their competence and their simple ability to wield a vote, shines through every effort. Carefully-kept records, neatly-ruled accounts and a photograph of NUWSS employees at work in a smart office all display a desire to be considered respectable and proper members of the mainstream. These polite screams for acceptance stand in sharp contrast to Greenham’s raucous refusal of the political, social and military norms of the day. Greenham’s quest for peace in a nuclear age and the NUWSS’ longing for legal equality were radically different, but this exhibition manages to bring out their shared spirit. Whether that is present in the printed image of a clenched fist, embroidered banners or black-and-white reportage photographs, the sense of energy and optimism is infectious. What is on offer here is a miniscule selection of the library’s collections, but having glimpsed these, it’s hard not to be curious about the rest. Transferred to LSE in 2013, the Women’s Library Collection is phenomenal. With over 60,000 books and pamphlets, more than 3,500 periodicals, 500 personal and organisational archives and over 5,000 objects such as posters, photographs, badges and banners, it is a mine of historical information. Registering for the library is speedy and simple, allowing the collection to reach anybody who wishes to come in and read. In addition to a raft of school-based outreach work, the library maintains extensive digital resources. The interactive timeline is particularly engaging, with well-chosen images and concise notes to offer a flavour of the events behind them, while the extraordinary Women’s Walks app application allows listeners to re-trace three historic walks across London. The exhibition shares a revolutionary mood with its heroes. Anybody can walk in and, without paying a penny, sample the spirit of protest from the 1870s to the 1980s and beyond. It is fitting that LSE, with its own history as a hotbed of dissent and activism, should play host to these inspiring materials. One hopes that the next generation of change-makers will make time to stop by and find something to get excited . The exhibition is open Monday-Friday, 9am-7pm and at the weekend, 11am-6pm. The image is by a photograph by alicepaulcollection and is used under a creative commons licence. 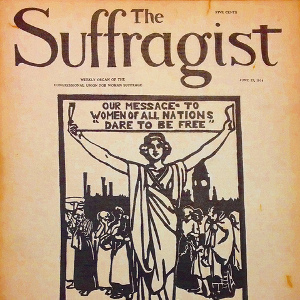 It shows the front cover of an issue of The Suffragist, with yellowing paper. 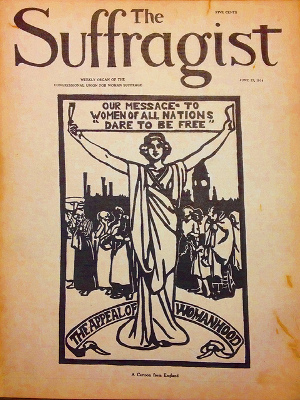 The title is at the top, with a black line drawing cartoon on the front cover of a woman in a toga/tunic holding up a banner that reads “OUR MESSAGE TO WOMEN OF ALL NATIONS “DARE TO BE FREE””. A crowd of people are behind her with the silhouette of buildings in the background. The exhibition sounds very appealing. Having said that, I think that it was a great shame that The Women’s Library was moved from London Met. University at all. However, at least the resources continue to be available to be accessed at the LSE.